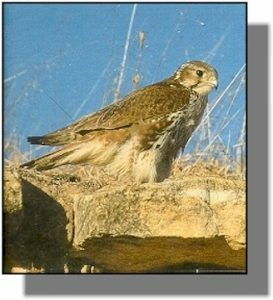 Distribution: The prairie falcon is a regular resident in western Kansas in the fall, winter and spring. It is rare in eastern Kansas. Food: Prairie falcons are skilled, determined hunters capable of taking a wide variety of prey, including many species of small to medium-sized birds, ground squirrels, prairie dogs, jackrabbits, lizards and large insects. They often hunt by flying low and fast, flushing and taking prey by surprise.